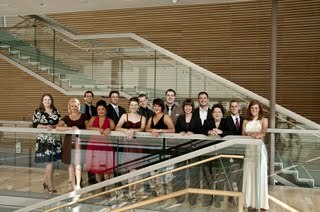 The 2009-10 edition of the Canadian Opera Ensemble Studio kicked off the popular COC Free Concert Series today at the Richard Bradshaw Amphitheatre, Four Seasons Centre. 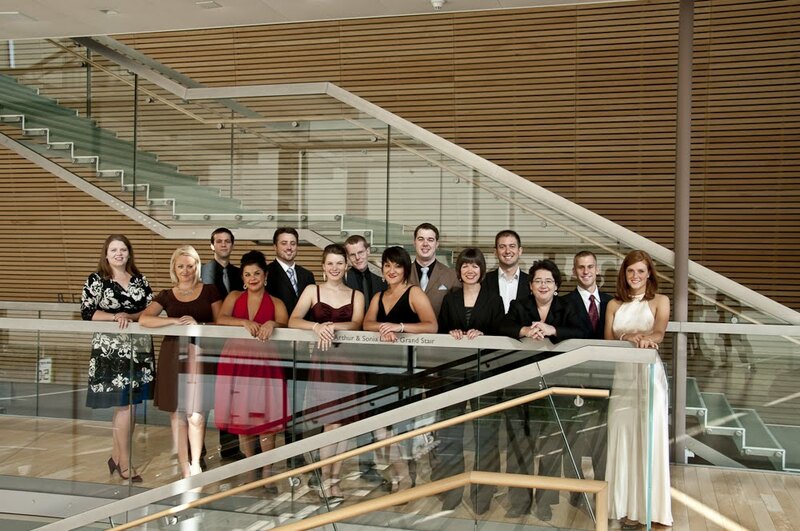 This was the first of ten concerts of the Vocal Series involving the COC Ensemble, scattered throughout the year. Since we generally don't get to hear these fine young singers on the mainstage in principal roles, these concerts represent good opportunities to get acquainted with their voices in more substantial repertoire. I should mention that the Vocal Series is but one of six Free Concert Series at the COC, others are series on Chamber Music, Dance, Jazz, Piano Virtuoso, and World Music. Voice fans will get a chance to hear up and coming singers, in a great venue with excellent acoustics. It is just too bad that the space is really too small to meet the huge demand - there is always a long lineup before each show and inevitably some unhappy opera lovers would have to be turned away. So remember to show up early! Given that opera is about voices first and foremost, it was fitting that the first concert involved the Ensemble singers. There are four new singers in the Ensemble this year - soprano Simone Osborne, mezzo Wallis Giunta, baritone Adrian Kramer, and bass Neil Craighead, joining returning members sopranos Laura Albino, Ileana Montalbetti, Erin Fisher and Teiya Kasahara, tenors Adam Luther and Michael Barrett, and bass Michael Uloth. All of them participated in today's concert. They are all highly talented, well schooled, expertly prepared by the COC musical staff. Each brings his/her own unique gifts of voice, musicality, personality, and stage presence to their performance. After a lengthy introduction by Ensemble director Liz Upchurch, each singer offered a brief word or two about their aria before plunging in. As is typical with this type of concerts, where there is no costume and scenery to help set the mood, a singer has precious little time to make an impression and do justice to the set piece he/she is singing. It can't be easy to do this "cold", and as a result, some of the singers came across as a little tentative. Others were able to throw caution to the wind and gave riveting performances. Of the returning Ensemble Studio singers, I particularly enjoyed soprano Teiya Kasahara, who sang and acted Queen of the Night's Act Two Aria beautifully and with great energy, nailing the staccato runs accurately and with focused tone. It was about the best I've heard her. Also noteworthy was soprano Laura Albino who sang the Gavotte from Manon with bright, attractive tone. It must have been difficult to be the first onstage, and she was not helped by an overly enthusiastic - some would say gauche - audience rudely interrupting her with applause after just the first verse. (Incidentally I think one of the verses was cut to begin with) It was to Albino's credit that she handled the interruption graciously. All four new Ensemble Studio members acquitted themselves well. I was particularly impressed with baritone Adrian Kramer, who made a strong debut with a scintillating and uninhibited "Largo al factotum" Not only was he the biggest ham among the eleven singers, he also used his compact, high baritone with style and intelligence. His hamming it up was all in fun of course, as it would be unwise to push his lyric instrument like this on a regular basis. Also of note is Simone Osborne, who sang Marenka's Aria from Bartered Bride with great feeling and musicality - and according to my Czech friend, excellent diction. The glamorous mezzo Wallis Giunta offered a deeply felt Dido's Lament. Overall, the singing was enjoyable, even if there was a curious dearth of mezza voce and high piano singing, even when the scores indicate. These quibbles aside, the concert amply demonstrated a strong group of young artists and it bodes well for the new opera season.